Now Acharya Shankara, along with the king Sudhanva and a large number of disciples, started on a Dig-vijaya - a missionary tour for the propagation of the Advaita doctrine by controverting all philosophies opposed to it. He first traveled towards Setu. On his way, he came across a sect whose followers were externally Shaivas, but drank liquor in their worship like the Shaktas. He entered into a very heated debate with these Brahmanas of Shakta persuasion, silenced them in argument for the good of the world, and made them accept the right code of rituals that he formulated. My question is, what is this Shakta-like Shaivite sect that Adi Shankaracharya defeated in a debate on the way to Rama Setu? Now being "externally Shaivas" while being fundamentally "of Shakta persuasion" sounds similar to the Kashmiri Shaivite sect, but as far as I know they weren't present in South India. But a similar kind of sect could have been present. In any case, the liquor drinking indicates that the sect was following Vamachara practices, so that might narrow it down. It can't Shaiva Siddhanta sect, for instance; see this question and answer. What you have pasted is found in page 209 of the English translation of the Madaviya Sankara Vijayam translated by Swami Tapasyanandha (Sri Rama Krishna Mutt). This translation however ignores a lot of content given in the sub text of the Sanskrit version. 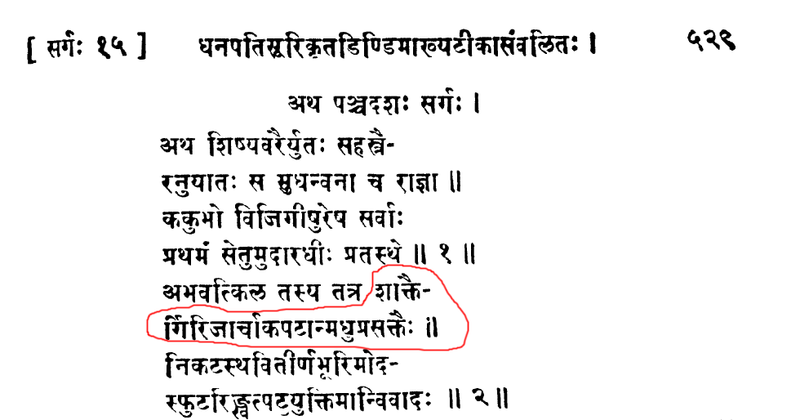 The Sanskrit version of the same text is supplemented by the commentary of Mahadeva Chimaniji Apte (and the Anandhashrama pandits) gives over 4 pages of details (in the subtext from page 527 to page 530) for just the 1 & 2nd sloka whose English translation is pasted by you above. The Sanskrit text mentions that they were the followers of the sect of Girija (highlighed in red) implying the mountain born girl (goddess partvathi's forms) who were addicted to the practise of consuming liquor in their rituals. This hints to prayers made to the one who is Rudra (or shiva's wife) or the same goddess who is prayed in today's tantric vamacara pratcices. In a lot of places, they are called as Padmakunkumapundrika - implying those who worship shakti (in her uma form by tantric vamacara means since they use madhu consumption as ritual) by wearing lotus coloured kunkuma on their heads. Examples are verse 17 (page 528) and verse 19 (page 529). having said that, no explicit mention of a sect name is made except that they are Girija (wife of Shiva) upasakas. All the arguments posed by Acharya against their principles are furnished till sloka 27 within the subtext (page 529). They finally accept defeat to Acharya's views and then are initiated into the worship of Sharadhambha by Acharya (sloka 28 in subtext, page 529). verse 15 talks about advaitha and knowledge of Brahma. Verse 16 then goes to say that "Vidya Rupa bhavani yo samproktha dvaitha bodhina". Those who state (or worship) bhavani as the vidyarupa (hinting vidyas of the dakshina tantric sect classified as vidya, mahavidya and Srividya in due ascending order of status) are preachers of dwaita (dvaitha bodhinaha). The later part of 16th sloka states that worshiping such forms gives chitta suddhi. Verse 17 says "Therefore abandon practice of kunkuma pundra (wearing kunkuma as vamachara sect does). Verse 18 says that the followers, baffled by this argument of acharya considered him as guru. Verse 19 says "Archarya taught them to follow the panchapuja vidhana after bating and doing their Sandhya rights. He then initiatied them into the shuddha Advaitha path. From Verse 20, the importance of MahaLakshmi Bhakti is given. Again in verse 26 onwards, a few of the same shaktas were converted to followers of Sharadhambha, initiated by Acharya. On a different note, i have read portions of both the Sanskrit text and the English translation. I find that Swami Tapasyanda only translates the slokas as is. The text by the anandhasharama gives a lot more details that one may need (but in Sanskrit) as subtexts to each sloka with a lot of other associated information (just like a bhashyam). Let me know if this answers your primary question. Not the answer you're looking for? Browse other questions tagged history practice adi-shankaracharya shaivism shaktism .